Magical Mystery Tour is a 52-minute British television film starring The Beatles – John Lennon, Paul McCartney, George Harrison and Ringo Starr showing the band tour in a themed bus with fans. In September 1967, The Beatles arrived in West Malling where they filmed various interior and exterior shots at the old airfield, including the Mystery Marathon. 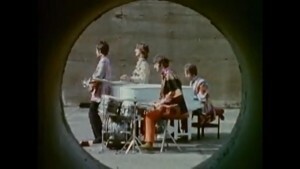 The band also performs I Am the Walrus on the airfield by the blast shelter, which later became the official music video for the song. The Beatles previously filmed in Kent at Knole Park for the music videos Strawberry Fields Forever and Penny Lane. Kings Hill is a housing and business development built on the former West Malling airfield site. The area has been used as a film location by projects such as Couples Come Dine With Me (2014), In The Best Possible Taste With Grayson Perry (2012) and Channel 4’s Cape Wrath (2008). The film was released on 26 December 1967 and is available to buy on DVD. This entry was posted in Filmed in Kent and tagged feature film, George Harrison, John Lennon, Kings Hill, Magical Mystery Tour film locations, Paul McCartney, Ringo Starr, West Malling Airfield. Bookmark the permalink.